The well known online casino software supplier NetEnt (or Net Entertainment to give the full name) has come up with yet another interesting and different casino slot game in the form of Mega Joker. What makes this casino slot game stand out is that there are in fact two three reel casino slots on top of each other and whilst the lower one is for regular play the upper one is used for gambling your winnings for much higher returns should you choose to do so. 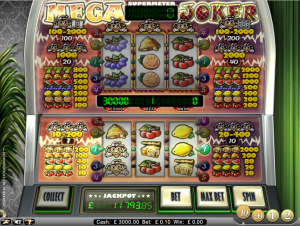 Mega Joker is in fact a very simple slot to play and with only 5 winning lines it is easy to follow. The choice of the number of coins to play at Mega Joker is also simple as you can either play one coin or ten coins and there is nothing in between but it should be noted that when playing only one coin then only bet line 1 is active and wins are automatically collected whereas when playing ten coins all five lines are active and you have the choice of either collecting your winnings or playing them on the upper level at what is known as supermeter mode. There is another difference between playing one line and ten lines at Mega Joker and that is that three joker symbols when playing one line provides a mystery win which is between 10 and 200 coins but when playing ten coins the mystery win is between 20 and 400 coins. In addition the value of the wins are at least doubled when playing in ten coin mode with three treasure chests paying ten times more. There are also only four choices of coin value which again makes Mega Joker a very simple casino slot to play and enjoy and they €0.10, €0.20, €1 or €2 and winnings are simply the number of coins multiplied by the vale that you have put on each coin although that is not relevant until you decide to cash out as the whole game is played in coins. Your total stake per spin is then simply the value of the coins which you have selected multiplied by either 1 or ten depending on which mode you are playing in with the maximum stake possible being €20 and the minimum being €0.10 which is a good range to suit all pockets. It is of course possible to pay Mega Joker in free play mode and in fact this is the default mode in online casinos that carry this casino slot. This enables a new player to try the game out and work out where the winning lines are. Mega Joker in free play mode is identical to real money mode so that an accurate representation of real playing conditions is provided. The exception to this is of course that the jackpot mode is not enabled in free play mode as there is no money going into the jackpot pool. At the start of the game select a coin value by clicking on the coins on the right hand side after which you can elect to play one coin or ten coins by clicking on the “bet” button with the “max bet” button automatically selecting the highest option. Any winnings will be automatically moved to the supermeter level but can be withdrawn to your bank by clicking the “collect” button. By clicking on the spanner symbol on the left hand side you can either switch on or off the sound and you can select fast play mode which really is fast and prevents the reels taking their normal spin action. To encourage casino players of Mega Joker to play for ten coins the payout percentage for playing one coin is 76.9% whereas by playing for 10 coins that increases to between 89.1% and 99%.